1 Free Simple Truth Ready to Drink Coffee (8 fl. oz., select varieties) in Kroger stores, with coupon. 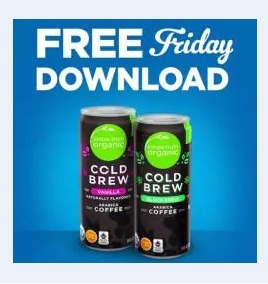 This Kroger Free Friday Coupon is available for download on Friday, January 18, 2019 but you have until February 3, 2019 to redeem it. What is Simple Truth Ready to Drink Coffee? Simple Truth Ready to Drink Coffee is the drink especially made for the ones that need coffee fast and now. Ingredients: Organic Skim Milk, Organic Milk, Organic Cold Brew Coffee Concentrate, Filtered Water, Organic Cane Sugar, Organic Erythritol, Natural Flavor, Gum Arabic, Monk Fruit Extract, Sodium Bicarbonate. Redeem your coupon in-store within 2 weeks for 1 free Simple Truth Ready to Drink Coffee (8 fl. oz., select varieties). Your coupon will automatically be applied at checkout when you use your Shopper’s Card. Available in most stores.